Why would we buy boulders from China? Why, oh why is the state of Hawaii, a place made up of vast quantities of stone, purchasing boulders from China ("Spiders from China slip into state," Newswatch item, Star-Bulletin, Sept. 21) and shipping them halfway around the planet at who knows what kind of cost? Now we have to contend with venomous spiders that hitchhiked on these rocks. At what cost? What bonehead is responsible for this? If we needed a specific kind of boulder, isn't there a place on our mainland, like Utah, Washington, North Dakota, Colorado or Wyoming, to get boulders? Or did someone just accept the lowest bidder? This is one of the stupidest bureaucratic muckups I've heard of in recent years. Hopefully, to make things worse, the decision maker on this isn't personally, financially involved and it was just a poor decision. In her Sept. 21 letter, Elaine M. Heiby compares the smoking law to segregation of blacks and whites (or internment of Japanese citizens or disregarding Hawaiian culture), thereby comparing smokers to members of oppressed racial minority groups, thereby comparing being a person whose behaviors could put others at a health risk to being Hawaiian in the 1800s, Japanese American in the 1940s, or African American in the 1960s. "Aloha will not be restored as a credible description of our island culture until all people are treated with the same respect," Heiby wrote. Guess what? I respect you. I respect your right to compromise your health and even your right to compromise the health of those in your life by not walking up to you with a pamphlet that states the obvious: Smoking is bad for you. You respect my right to breathe fresh air by not smoking around me. There are probably many things about any given smoker that I'd respect. I can respect a person for being hardworking, insightful, a good mother, a gifted comedian, an awesome attorney. Though I have to accept your choice to smoke, I don't have to respect you for being a smoker, and I don't have to accept your smoke. How can you not see that respect and aloha are built into that law? Perhaps Elaine Heiby, in stating that some people "enjoy the smell of smoke," also thinks that these same people enjoy paying upwards of $6 per pack for something that could eventually give you lung cancer, emphysema or any other smoking-related disease. Why should other people have to endure the stench of cigarettes just to appease people who are addicted to nicotine? Telling a smoker not to light up for several hours is a lot different from forcing someone to sit at the back of the bus just because of his or her skin color. I am writing in response to Friday's letter in which the author drew parallels between the smoking ban and the struggles of civil rights movements and racial minorities. If one possesses this belief, one is making a mockery of the struggles of African Americans, Japanese Americans and native Hawaiians to gain civil respect, privileges and rights in American society. I assure you, by not being permitted to smoke around nonsmokers, this individual has not and will not experience a hint of what was experienced by African Americans in the South during the '40s, '50s, '60s and even today. Furthermore, these parallels show an utter misunderstanding of history and of why the practices by the U.S. government truly were inhumane. One does not bring inherent physical harm to their fellow humans by being an African American, Hawaiian, Japanese or any other race. I'm not going to get cancer from hanging out with somebody from Japan while they do Japanese things. Moreover, one does not choose to be African, Hawaiian, Japanese, Chinese, German or French. Individuals choose to smoke. The entire argument presented fails to follow the tenets of simple logic. The letter writer should take a step back, read a history book, and evaluate the gravity of the struggles that minorities suffered and still suffer that truly are inhumane. As a retiree living off the fruits of the capitalistic system, I am mindful of the material benefits accrued to me and my family over the past several decades, and I am grateful for those benefits. At the same time I am cognizant of the ills that accompany capitalism, those social and environmental losses that stem from the drive for ever greater expansion and profit. On a planetary scale I fear the consequences of global warming, already evident and generated, for the most part, from economic over-development. On a community scale, I feel ever more compelled to stand with the activists and protesters who are opposing business development in Hawaii. Of course, our islands require a balance between social, economic and environmental needs, but nature is warning us that economic development must follow a middle way. For at least the short term, until we can regain our balance, we need to set aside the mantra of "more is better" with one of "less is more" ... including my retirement income. The editorial "Hawaii now known for animal cruelty" (Star-Bulletin, Sept. 17) is misleading. In June, Gov. Linda Lingle signed Act 114, which creates felony-level offenses for acts of animal cruelty. Your criticism should be directed against the state's dogfighting laws. This is not surprising given the recent interest in the Michael Vick case, but the focus should be on animal fighting as a whole and not just on dogfighting. A review of legislative records will show there have been numerous attempts to toughen animal fighting legislation. While the law establishes felony level offenses for any person who engages a dog in a dogfight, it fails to extend these penalties to the people who attend these events. Hawaii's cockfighting laws are among the weakest, making it a misdemeanor for a person to engage or participate in a cockfighting exhibition. The Hawaiian Humane Society has worked tirelessly to strengthen Hawaii's animal welfare laws. The passing of the felony animal cruelty law and the groundswell of community support in favor of stiffer penalties should serve as a wake-up call to our legislators that much more needs to be done. We are committed to working with our community and the Legislature to toughen existing laws that will make Hawaii safe for our animals, and ultimately our people. Who's looking out for UH quarterback? Now the truth is out about why University of Hawaii quarterback Colt Brennan was able to overcome an ankle sprain and deliver a command performance during the Sept. 15 game at Nevada. Brennan was given a shot of a pain-suppressing drug, Marcaine, so he could play injured. Is anyone on the UH coaching staff looking out for Brennan's long-term interests? Would it not have been more prudent to have Brennan sit out a week -- or maybe two -- to give this apparently serious injury a chance to heal properly? More than a thousand people filled the Kauai Convention Center Thursday to discuss the Hawaii Superferry with Gov. Linda Lingle and other state officials, whose remarks were frequently interrupted with jeers. 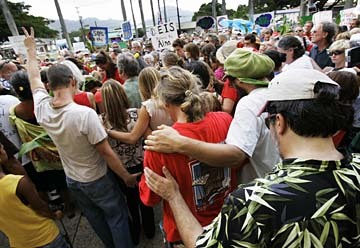 Prior to the meeting a rally in opposition was held in front of the historic Kauai County Building. After seeing pictures of the people who were protesting the new Hawaii Superferry (Star-Bulletin, Sept. 21), I began to realize that maybe an environmental and "cultural" impact statement should be applied to people who come to Hawaii from other places, buy up all the land, change the cultural climate to suit their lifestyle and then act like idiots when real local people want to use the ferry to visit their families. The governor abused her power by ordering the Department of Transportation to avoid a state law-required full EIS. She says the Superferry is good for the state. It is good for Oahu. We don't mind the tourists. The outer islands don't want their drug addicts, drug dealers, criminals and homeless streaming over to our homes. The fact that the ferry rushed into service with $5 fares and stranded hundreds of people and cars on Oahu and Maui while knowing the hearing on whether it should be allowed to begin service would be held the next day was unconscionable. The state attorney general should be conducting an independent investigation into this entire fiasco. Instead, he is attending a press conference side by side with the governor and threatening to arrest protesters on Kauai. Shame on them all! Don't think that the tourists on the mainland have missed the boorish behavior surrounding the Superferry by people on Kauai and Maui. While I would likely never ride the Superferry as a mainland tourist, I will not go on vacation where I am not welcome, and I don't feel welcome on Kauai and Maui anymore. For my next vacation I will give Cabo San Lucas, Mexico, a shot. Who knows, maybe I'll like it, and then in a few years you can wonder why tourism is falling off. Don't worry, I'll tell 10 of my friends why I am going to Cabo instead of Hawaii this year. I still don't understand why cruise ships are OK, but I don't have to figure it out, I just won't visit Hawaii until the spirit of aloha returns. On stage at the Kauai War Memorial Convention Center Thursday evening was a class act starring Gov. Linda Lingle and a supporting cast of federal, state and county officials who answered with dignity some tough questions about the controversial Superferry. What a contrast they were to the far-too-many Superferry protesters who continually interrupted the town-hall-type meeting to hurl profanities and insults at the panel. What type of aloha is that? While the foul-mouthed protesters were acting like spoiled children throwing temper tantrums, panel members were very un-government-like by actually answering questions instead of dodging them. The brats would ask legitimate questions then jeer so loudly that panel members would have to patiently wait to provide answers. These brats need more than a spanking. They should be grounded by the Coast Guard until they learn some manners.